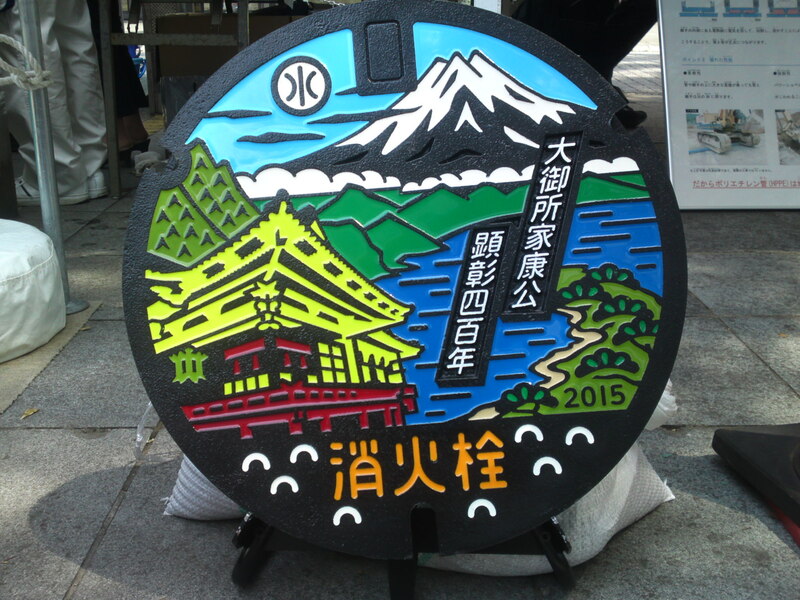 Manhole Covers in Shizuoka Prefecture 37: The One That Will Never Appear On Shizuoka City Streets! 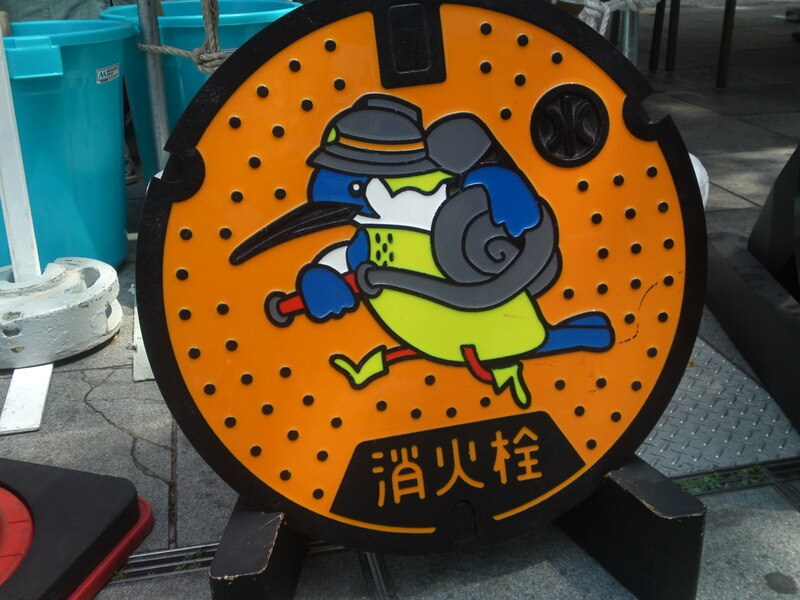 Last Friday the Shizuoka City Water and Sewers Department were holding an unusual and very instructive exhibition to make the public aware of their work from manhole covers to the functioning of toilets with a strong accent pn public hygiene! 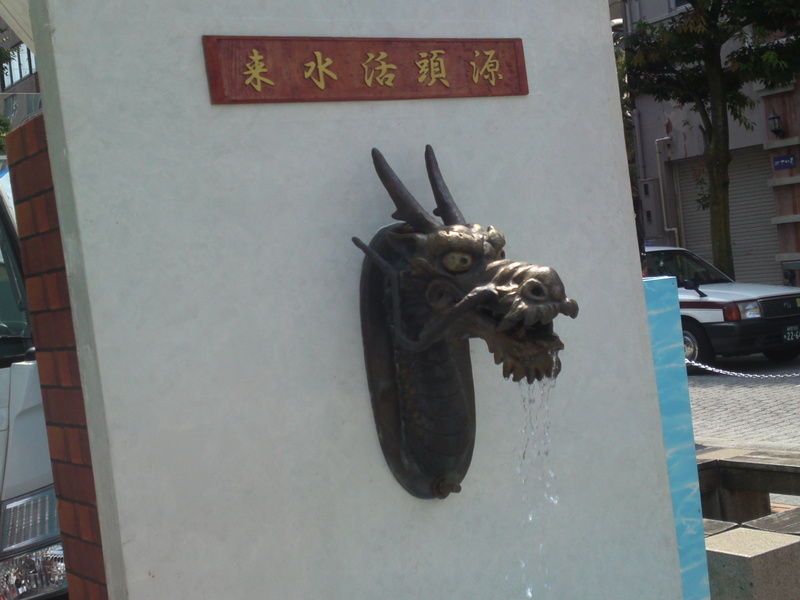 Visitors were greeted with two of these public water spouts in shape of dragon head! 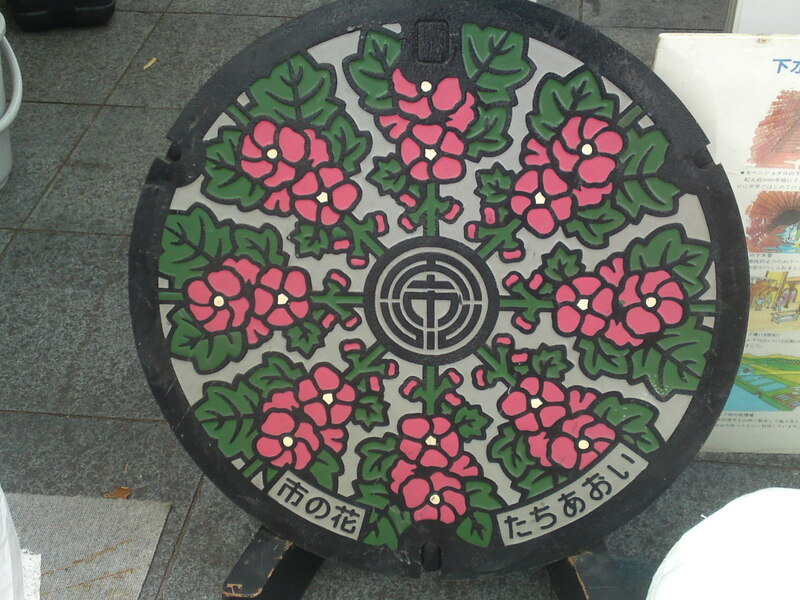 Quite a few fire hydrant and waterways manhole covers in their mint form were on display including a guest in the shape of a flowery design from Aichi Prefecture! 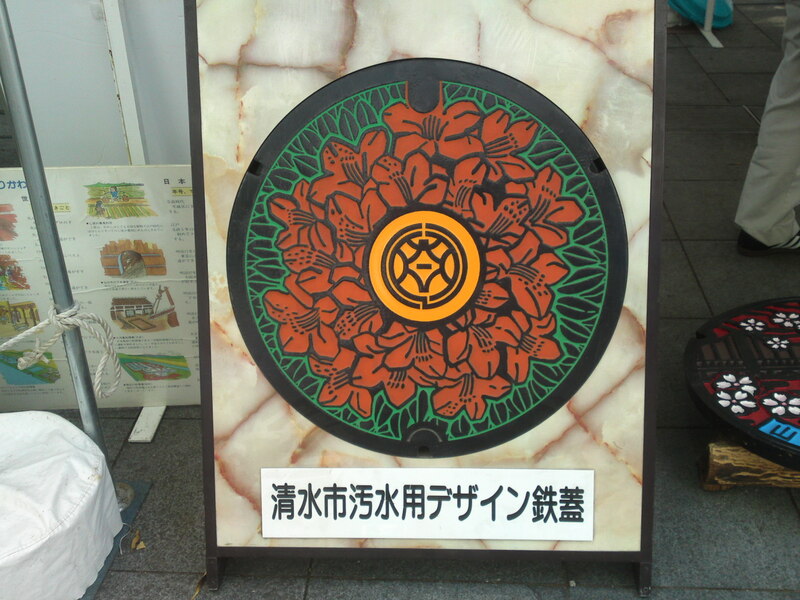 of course the hollyhock, emblem flower of Shizuoka City (for waterways) was exhibited! Actually there exist more than 8 types of the same design! 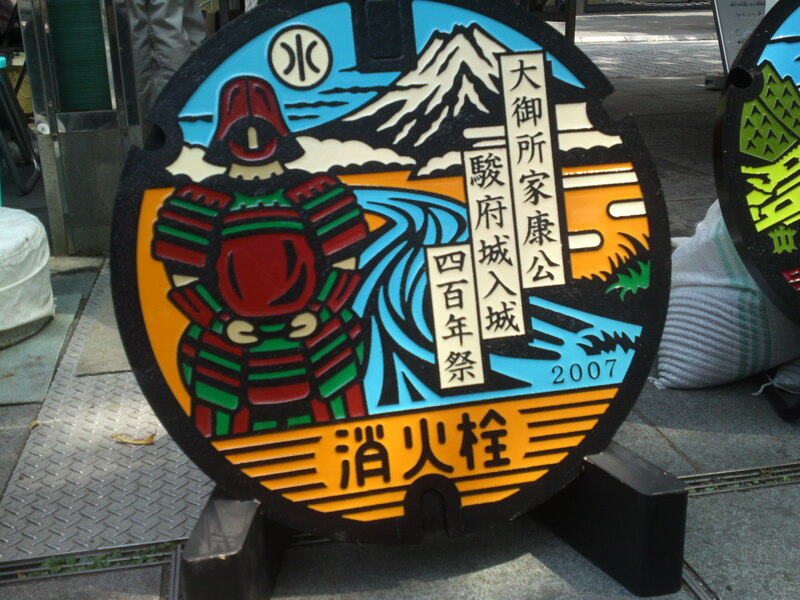 There was also a mint of a fire hydrant manhole cover from Shimizu City before its merger with Shizuoka City! 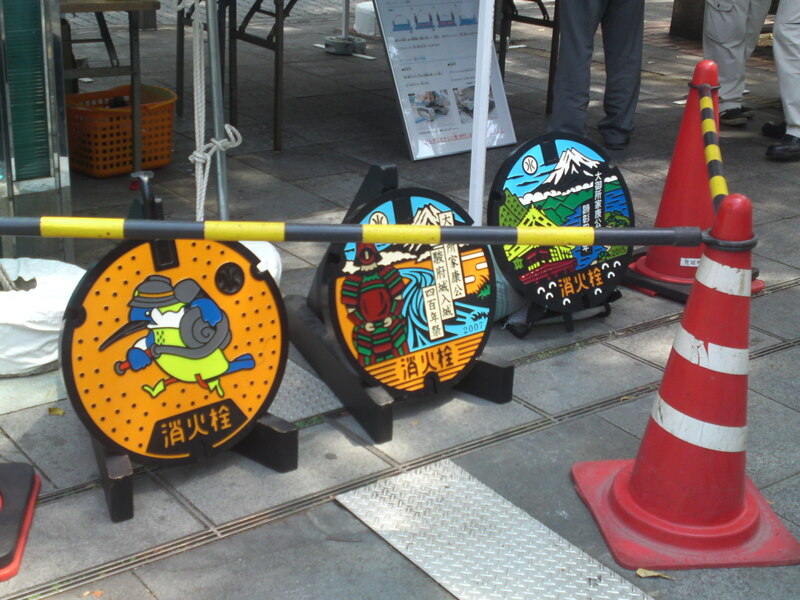 The start display was of the three most recent fire hydrant manhole covers in Shizuoka City! I have described those two in recent articles! This one was minted in 2007 to commemorate the 400th Anniversary of the retirement of Lord Tokugawa Ieyasu to Sumpu (the old name of Shizuoka City!)! 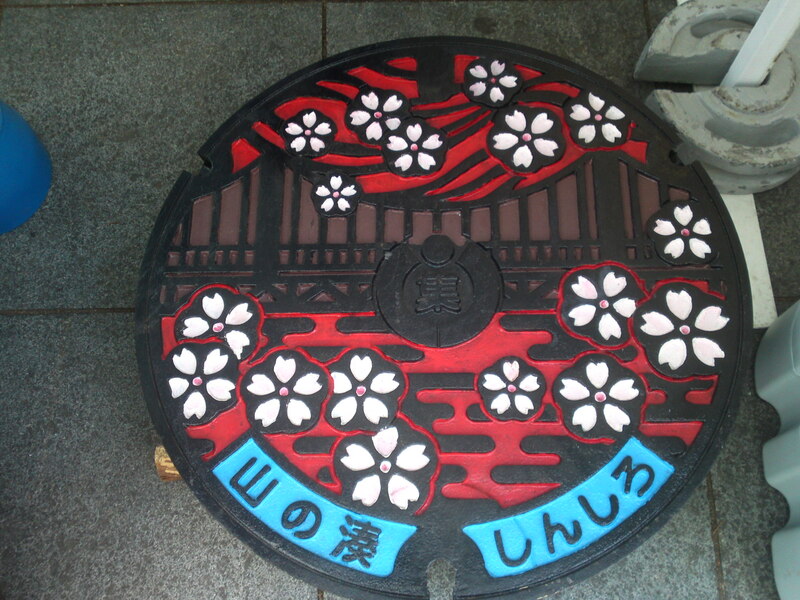 This was laid on February 24th this year to commemorate the 400th Anniversary of the Death of Lord Tokugawa Ieyasu in our city! 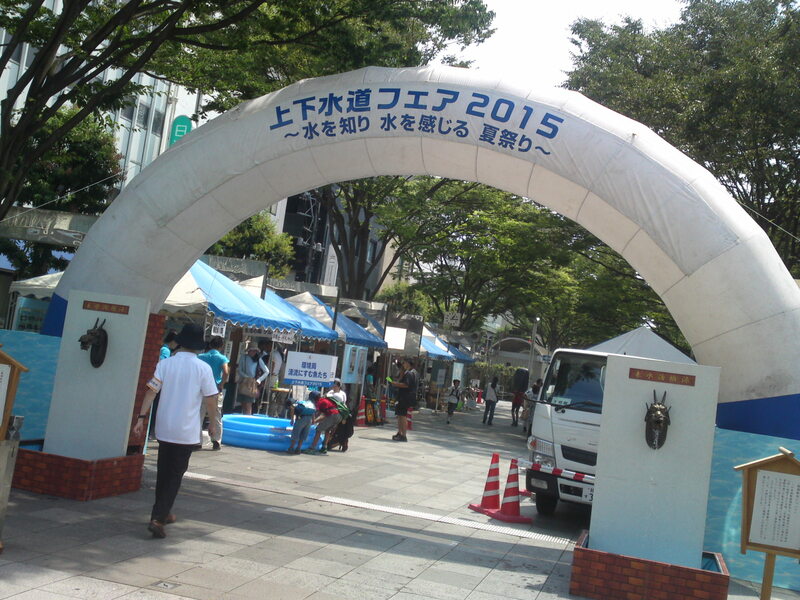 These are the very newest designs to be laid in Shizuoka City! 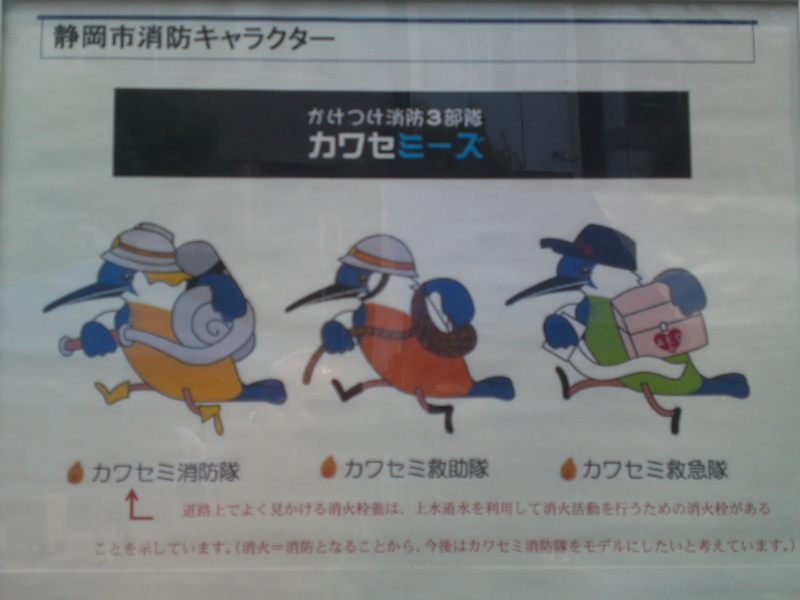 The character on all three designs is a kingfisher, the emblem bird of Shizuoka City! But unfortunately it will be some time before we can admire them in our streets! 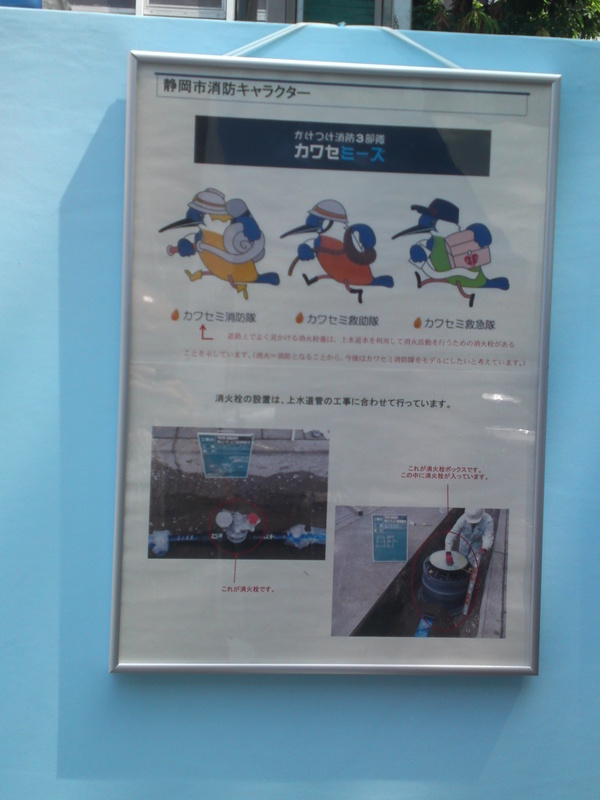 This is the mint of a firefighting kingfisher! When I asked the civil servants where we could them, they first replied they did not know exactly. Later they were kind enough to meet me again with more of their colleagues who were actually extremely helpful and kind. The story is we will never see this particular design as it was found out the surface would become too slippery when wet. Therefore this has become a mint proof that will ot be reproduced. On the other hand the city is re-designing the cover to improve its safety but no one knew when they would appear yet! A rare find if there is one! Great for my collection until we see the new ones! It would be a sham not to discover them as they are so cute! 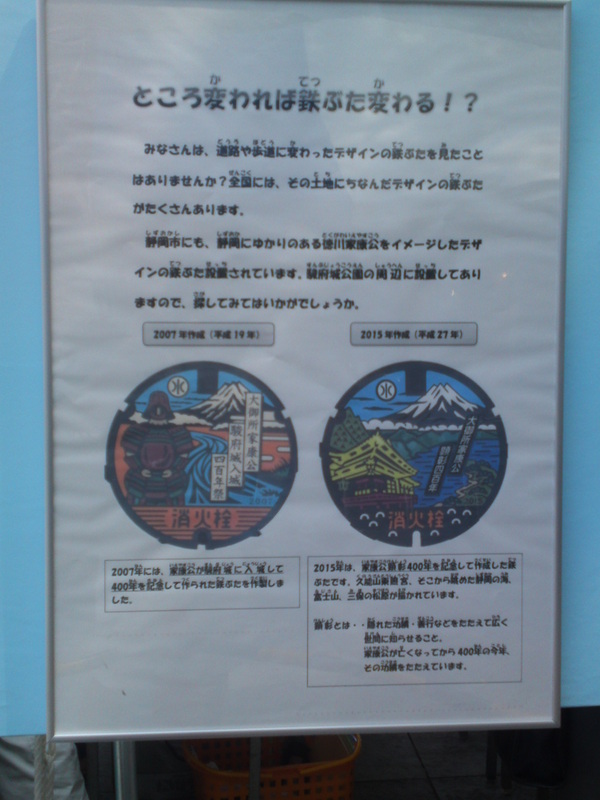 Previous PostKURA: Traditional Japanese Warehouses in Shizuoka Prefecture 27: Akino Family House in Shimada City!Next PostManhole Covers in Shizuoka Prefecture 38: Nishigaya Sports Center in Shizuoka City!